Low blood pressure is also known as Hypotension. It is characterized by a consistent blood pressure reading of 90/60 mm Hg or less than that. The normal blood pressure reading is 120/80. Unlike high blood pressure or hypertension, low blood pressure is usually not a big concern in healthy adults. In fact, it is considered as a sign of good cardiovascular health. However, it should not be ignored in case it starts interfering with your day-to-day life. The most common symptoms of low blood pressure are dizziness, lightheadedness, fainting, blurred vision, fatigue, nausea, excessive thirst, shallow breathing, headache, pain in the chest, pale skin, and so on. Underlying conditions like neurological, endocrine, or cardiac disorders may also give rise to these symptoms. Besides, low blood pressure can be caused during the first 24 weeks of pregnancy. Moreover, older adults and individuals taking certain types of prescribed medications like diuretics, drugs for Parkinson’s disease, alpha blockers, beta blockers, etc. are prone to this problem. Licorice root can prove useful in raising blood pressure. It is also good for those suffering from chronic fatigue syndrome. Plus, it helps reduce body fat mass but tends to cause fluid retention. Hence, when dealing with low blood pressure, you can take 400 to 500 mg licorice root. Do not take it in excess, though. Raisins are considered highly beneficial for regulating blood pressure. For best results, you can soak about 10 raisins in water overnight. In the morning, eat these raisins one by one, on an empty stomach. Make sure you chew them properly before swallowing. You can also drink the water in which the raisins were soaked. Follow this natural treatment for at least one month. Taking fruit juices and drinking adequate water throughout the day are useful for maintaining healthy blood pressure. In fact, dehydration is one of the most common causes of low blood pressure. Besides, you can eat healthy and nutritious fresh fruits. Another great way to improve your blood pressure is to have fruits with ice-cream or yogurt. In addition, it is recommended to avoid smoking cigarette and limit your alcohol intake as they can contribute in causing dehydration. Low blood pressure is often attributed to vitamin B12 and folate deficiency. Hence, it is necessary to incorporate foods rich in these nutrients in your diet. The Recommended Daily Allowance of vitamin B12 is 2 mcg. Significant deficiency of vitamin B 12 can be indicated by the appearance of lines or ridges on the nails. Plus, the moons at the bottom of the nails tend to disappear. This deficiency, in turn, causes Megaloblastic Anemia. 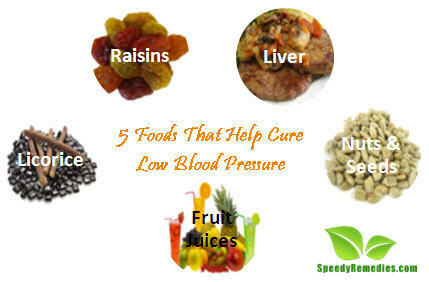 Thus, individuals suffering from low blood pressure can take liver, salmon, trout, etc. as these are good sources of vitamin B12. If you are looking for pure vegetarian options, then you can take milk and yogurt. Plus, you can have fortified breakfast cereals. Consider snacking on a handful of salted pumpkin and sunflower seeds to increase your salt intake and stabilize your blood pressure. Moreover, these seeds are loaded with vitamin E. You can have roasted groundnuts, too. Plus, it is suggested to use asafetida in your foods. Apart from taking these foods, adopt some lifestyle changes like eating small meals at frequent intervals rather than large meals only 2-3 times in a day.